HOUSTON, TEXAS (November 23, 2012) Playing a much better brand of basketball than they have in their first four games of the season, the Houston Cougars eked out a close win over a tough Northeast Missouri University squad 61-44 in the first game for both schools in the David Jones Classic at Hofheinz Pavilion. Senior guard Porsche Landry without a doubt had her best game of the young season, scoring 19 points with six of them coming from three-point range to raise the Cougars record to 1-4 for the season. The Houston native played in her 100th game as a Cougar and played in all but six minutes of the contest. Houston was a dismal 37.7% from the floor but did tally a healthy 61.5 % from the free throw line. The Cougars led the floor with rebounds, tallying 40 with 19 of them coming from the offensive side. Freshman guard Alecia Smith and junior center Yasmeen Thompson contributed with 14 and nine pints, respectively. Thompson also led all players with 10 rebounds. For Southeast Missouri, Bailie Roberts scored 17 points, followed by Jordan Hunter with 10 and Allyson Bradshaw with eight. Southeast Missouri fell to 2-3 with the loss and will face UT-Pan American on Saturday. Houston will next face Northwestern State with a 12 noon tip-off. Those fans with tickets to the Houston-Tulane football game will be admitted free-of-charge with their football ticket. Junior College Athletic Association national tournament. ﻿﻿WEST PLAINS, MO (November 19, 2012) The San Jacinto College volleyball team finished the 2012 season with a third place finish at the National Junior College Athletic Association (NJCAA) volleyball tournament held this week at the West Plains Civic Center in West Plains, Mo. San Jac (36-3) entered the tournament as the fourth seed, and went 3-1 at the three-day national tournament. San Jacinto College knocked off 13th-seed Casper College 3-0 (25-13, 25-13, 25-19) and fifth-seed Tyler Junior College 3-0 (25-18, 25-13, 25-23) on the opening day, Thursday, Nov. 15. San Jac then fell to the top-seed, College of Southern Idaho, in four sets (25-23, 27-25, 14-25, 25-20) on Friday evening, before rebounding for a 3-1 win over No. 3 Iowa Western Community College (22-25, 28-26, 25-23, 25-22) Saturday afternoon. It is the seventh-consecutive top-10 national finish under 11th-year Head Coach Sharon Nelson. 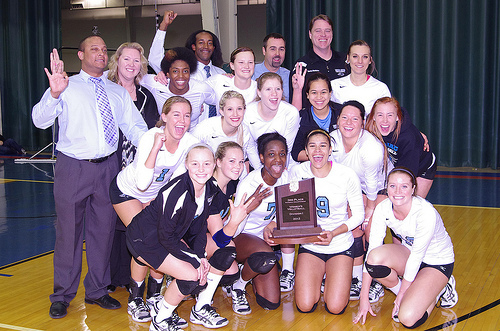 Last season, San Jacinto College finished fourth, and in 2010 it was the national runner-up. For more information about San Jacinto College volleyball, visit www.sanjacsports.com. HOUSTON, TEXAS (November 17, 2012) The Houston Cougars climbed to 3-0 for the season Saturday night with a 87-47 win over the Grambling State Tigers in front of 3,178 fans at Hofheinz Pavilion in Houston. The win gave the Cougars their second consecutive 3-0 start under head coach James Dickey. Three Cougars score in double figures, with sophomore guard Joseph Young coming off the bench to lead the team with 23. Sophomore forward TaShawn Thomas contributed 14 points, with freshman forward Danuel House adding ten. Young was efficient from the floor, contributing with five assists and two rebounds in only 21 minutes of play. The Cougars hit 62.1% from the free throw line and 46.3% from the field. Houston also controlled the defensive end of the court with seven take-a-ways, seven blocked shots, and 12 steals. Rebounding was a bit better than the previous two games with the Cougars totaling 45 rebounds, but was limited to 15 coming on the offensive end of the court. Thomas led the Cougars with eight rebounds, seven defensive and one offensive, along with two blocks and two steals. Young also was perfect from the free throw line, connecting on eight-of-eight shots. With the loss, Grambling State fell to 0-5 for the season. The Cougars will have a quick one day turn-a-round as the face Louisiana College on Monday evening with a 7:00 p.m. CST tip-off at Hofheinz Pavilion.